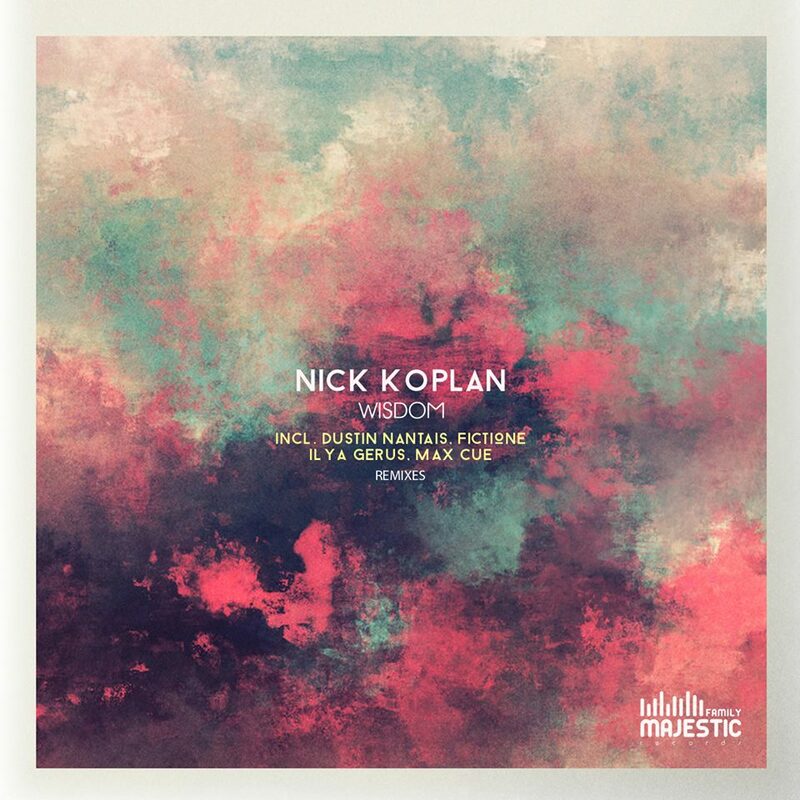 The latest release on Majestic Family Records welcomes Nick Koplan to the label for his first single. The Russian artist made a huge impact on the progressive house underground last year with releases on Balkan Connection, Movement Recordings and Yin::Yang. Now making his much anticipated Majestic Family debut Nick presents his latest single entitled ‘Wisdom’ alongside remixes from FictiOne, Ilya Gerus, Max Cue and Dustin Nantais. Although the majority of Nick’s previous productions have been in collaboration with fellow countryman Ian Meyer here we see him going solo with great results. The tightly knit ‘Wisdom’ is immediately appealing and as the track unfolds so too does a gorgeous storyboard of soundscapes and melodies. Warm, hazy overlays set the stage for anthemic chords, which in particular dominate a gorgeous break, ultimately leading to a goosebump worthy moment and very tasteful drop. Gorgeous work from Nick. Majestic Family has gone big on the remixer selection with four and leading the way is FictiOne. Known for his releases on A Must Have, Electronic Tree and Stellar Fountain the Polish artist takes ‘Wisdom’ into more techno inspired territory. The groove comes off a bit tougher, with beefed up drums and rugged rhythms leading the way, thus bringing more of techno vibe while the textural elements are very well represented all throughout the journey. A brilliant deep techno interpretation from FictiOne. Next up Ilya Gerus makes his eighth appearance on the label following strong releases on Superordinate Music and Aethereal. The Russian artist has been a staple of the old school underground for many years and brings a darker tone to ‘Wisdom’. Not only is it a great complement to the previous two versions but it’s brooding qualities are liking to win over some melodic techno DJs as well. A dramatic break proves to be the highlight while a tough yet atmospheric third act takes you home nicely. The third interpretation of ‘Wisdom’ is provided by Max Cue who is making his debut on Majestic Family. The Belgian artist has been a primary contributor to Paul Hazendonk’s Manual Music and MNL imprints over the years where his melodic techno sound has flourished. Always bringing great emotion to all his work Max does so once again on his ‘Wisdom’ interpretation. Warm, rolling and blissfully melodic it’s gorgeous from start to finish. Strong design makes it a very interesting listen while a great rhythmic core keeps it firmly on the dance floor. It’s just a touch epic and gets so much accomplished in under seven minutes. Stellar remix from Max. The release concludes with Dustin Nantais returning to the label for his 10th appearance. After a hugely prolific 2015 the Canadian artist had a lower output in 2016 and it only made his productions all the more sought after. Continuing a strong relationship with Paul Hazendonk’s Manual Music Dustin ended the year with a remix on the Dutch imprint along with a two track EP on Mellophonic. It’s hard for me to come up with an artist who has been more creative in his approach remixing than Dustin and he’s certainly proved that again here. Radical revamp doesn’t even begin to describe it with amazing vocals and guitar hooks all wrapped up in a disco state of mind. Certainly one of Dustin’s most creative remix projects to date and I applaud him for it. It rounds out a superb release from Majestic Family with FictiOne, Max and Dustin really shining in my opinion. Don’t miss it.